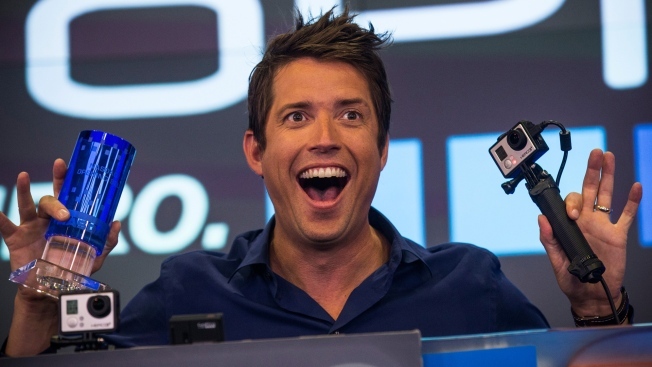 File image shows Nick Woodman, founder and CEO of GoPro, during the company's initial public offering at the Nasdaq Stock Exchange in 2014. Wearable camera maker GoPro says it will eliminate about 100 jobs after its fourth-quarter sales fell far short of its expectations. GoPro says fourth-quarter revenue was $435 million instead of the $500 million to $550 million it forecast in October. The company lowered the price of its new Hero4 Session camera after saying it made the product too expensive. That reduced its fourth-quarter revenue by $21 million. The San Mateo, California, company had around 1,500 employees at the end of 2015 after hiring more than 500 people that year. It is cutting 7 percent of its jobs, or around 100 positions. GoPro Inc. has dropped 71 percent in the past 12 months and finished at $14.61 Wednesday. The stock fell 28 percent in aftermarket trading. A turtle had a GoPro camera strapped to its shell during a swim near the Great Barrier Reef, shared by the World Wildlife Federation in Australia.